. . . are over at Suvudu. I read at Mysterious Galaxy last night, with Kim Stanley Robinson. If you’d told me in the summer of 2007 that two years from now I’ll reading alongside KSR, I’d have asked how much you were paying your dealer, and could I get in on the action. That said, there’s nothing like being holed up in the middle of Orange County to ground one, as that’s where I am now, awaiting the start of ComicCon. Meanwhile, BURNING SKIES is available in the U.S. right now! Spartacus passed away yesterday evening, two weeks shy of his first birthday. He was diagnosed with FIP last week; as soon as I got the news, I cut short my west coast trip and flew back to be with him across his final days, which I like to think I made a little easier. By the end, declining rapidly into kidney and liver failure, and no longer eating or drinking, there were no other options left than to send him on his way. For any of you pet-owners out there who end up faced with the situation you’ve most dreaded, consider having the vet make a house call. Spartacus died on my bed and in my arms; he had a very scary hospital visit last weekend, and I wanted him to spend his last hours at home, surrounded by familiar things. 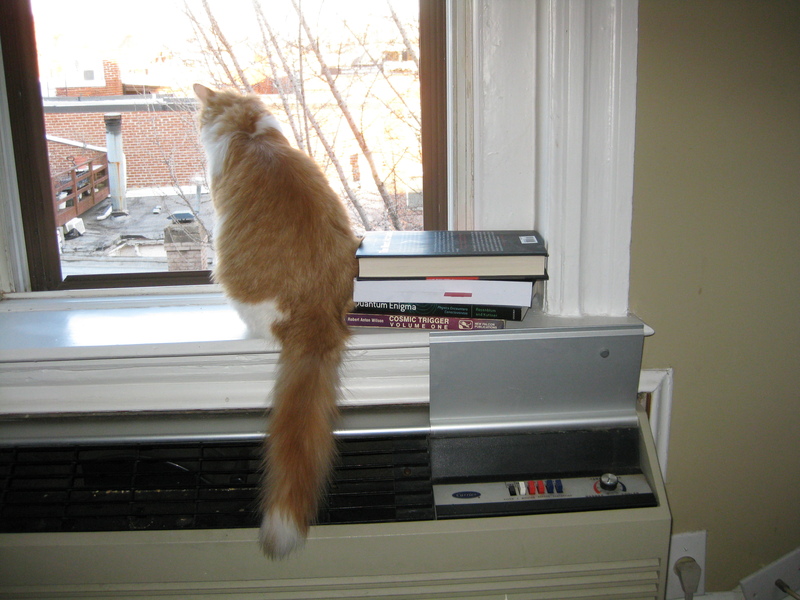 He was a very special cat who enjoyed eating fish and chasing mice and watching pigeons; for once words fail me, as I will miss him far more than I can say. —Dinner with writers David Levine and Kamila Miller prior to the reading at Powell’s. DL, thanks again for organizing it! —Catching up in Portland with my old friend Paula Bednarek, who I went to high school with and who local D.C. writer Tom Doyle was at Stanford with. Small world. —Having lunch with UWashington professor Thomas Foster, author of SOULS OF CYBERFOLK. A tremendous book, and one that I’ll be posting about separately shortly. —Meeting some of this year’s Clarion West class. Can’t believe it’s been two years since I walked down that road. —Dinner with Neile Graham, Clarion administrator and first-rate writer/poet. —Flying VirginAmerica. Those guys put all the other airlines to shame, not least because they have this really radical idea about being nice to their customers. —Watching the UFC100 at a friend’s bachelor party Saturday night . . . and listening to what’s probably the most memorable victory speech I’ve ever heard. Meanwhile, BURNING SKIES continues to be yours for the buying! A leading luminary of the field, he will be much missed. Gail Carriger’s piece on him is worth reading: a “barefoot, autocratic, jovial hobbit.” RIP CB. At UBookstore at 7 p.m.! See you there. . .
And if you can’t make it, you can always have BURNING SKIES delivered right to your doorstep! I’ll be reading in Portland tonight: @ Powell’s Books. . . . Beaverton location at 7 p.m. 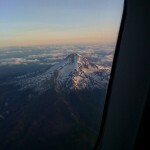 Check out the cool shot of Mount Hood I snapped from the plane on the way in. It’s great to be back in the Pacific Northwest. . . and don’t forget, reading in Seattle at UBookstore tomorrow night! Missile defense: Russia would like nothing better than for the U.S. to dismantle its plans for missile defense facilities in Eastern Europe. This is unlikely to happen, but the key variables are (a) the administration’s overall posture toward missile defense (which is still being defined), and (b) whether Russia will ultimately insist on a formal linkage between that and overall arms control talks (in particular the still-unresolved questions around bombers/launchers). While the defense facilities themselves would appear to be directed at Iran rather than Russia, a heavy NATO presence in Eastern Europe is something that makes the Bear nervous. To say nothing of the possibility that the current “Son of Stars Wars” will ultimately be a stalking horse for a more robust space-based systems. The conversation so far has both sides biding their time, agreeing to study cooperation options, i.e., defer the key decisions to a later point. And of course there’s no better way to prepare for those problems than to read BURNING SKIES.